SRC meets up with Education Campus students about the lack of quality and affordable food. AFFORDABILITY: The town hall meeting at education campus raised another critical issue. Photo: Tshiamo Mononyane. Students at the Education Campus are complaining about what they say is a lack of quality and affordable food. This was one of the many issues raised at the town hall meeting held at the campus on Tuesday, April 17. The meeting was organised by the SRC to address concerns of students based on Education Campus, and the availability of food was one of the items on the agenda. 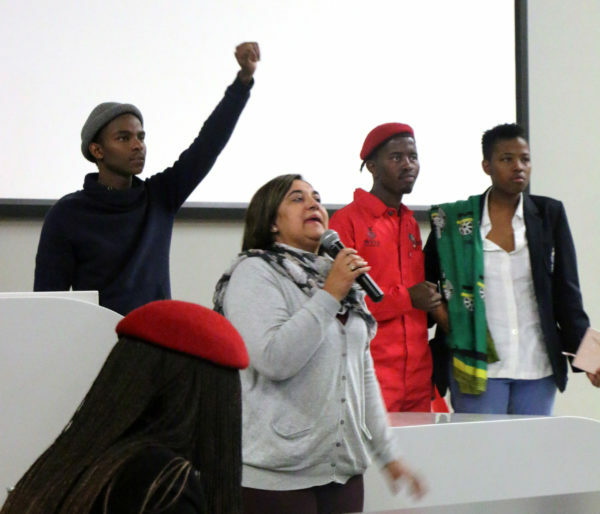 SRC president Orediretse Masebe said at the meeting, “Education Campus is not taken seriously. We see it in the service delivery. “As the SRC, we’re making it our mandate to make sure that affordable food outlets are opened before the end of this year on Education Campus. We want to make sure that Education Campus students have access to quality and affordable food,” said Masebe. Karuna Singh from the Wits Citizenship and Community Outreach (WCCO), who is also responsible for the food packaging system, addressed the issue of students not receiving food packages. The WCCO provides food packages for struggling students. Some food items included in the packages are baked beans, morvite, rice and oats. Lecturer Bhekuyise Zungu, who is involved with student affairs at Education Campus, said that students were required to register to receive food packages but most of them did not register. Masebe says the SRC is in talks with head of services to open affordable food outlets on the Education Campus.